If you like the idea of running but you find running too painful, feel lethargic, or can’t get the motivation you need, here are five top tips to get you out the door and back with a big smile on your face. The biggest mistake most runners (beginners and experienced alike) make is to go too fast too soon. When you start a run, your muscles require more oxygen, but your heart and blood vessels need time to respond to the increased demand. This means that for a while, you are working anaerobically (your muscles are turning glucose into fuel without oxygen), which is an uncomfortable process. Next time you head out for a run, spend the first five or ten minutes easing into the run. If you’re finding that each step is a struggle and you are simply counting down the distance back to your house, you are running too fast. Try running a little bit slower, at a pace where you can hold a thought that is not simply ‘I am tired and want to go home’. If you’ve reached the right pace, you’ll find your brain starts to wander, and, with your higher levels of endorphins, it usually wanders to very happy places. Now that you’re running at a far more sustainable pace, you can start having fun with intervals. Pick out a tree in the distance, and pick up your pace until you get there. 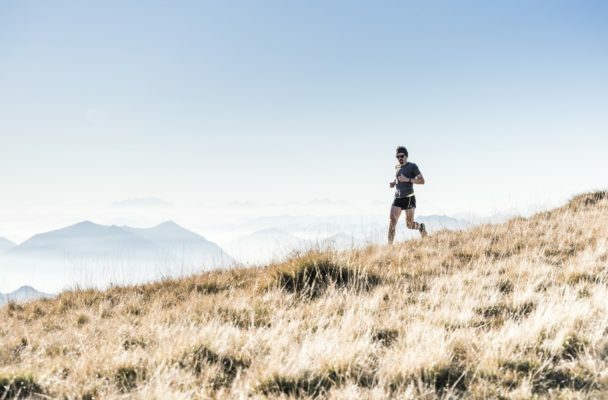 Instead of starting at a sprint, start by lengthening your strides (taking bigger steps) and gradually picking up the pace, aiming to reach a sprint before you get to your end point. Once you’ve reached the tree, slow right back down (but try not to stop), and focus on your breathing as you work your way back to the sutainable pace you’d found before. Repeat as many or as few times as you’d like during your run. There is something very magical about running as the sun is rising. As you head out, streets will be quiet, parks will be empty, and birds will be singing (yes, you can even hear birds in London if you’re up early enough!). As you’re running, the city will wake up around you, and by the time you get home you will feel like you got a little bit more of the day than anyone else. Breakfast will also taste amazing. Sunsets are fun too —try to find a hill near your house or work, and head up to the top of it to watch the sun set over your town. The run back down will feel cool and breezy, and you’ll be left with quite a high. Everything is more fun when you’re with friends. Running with a buddy will not only motivate you to actually put on those running shoes, but if you’re talking during your run you’ll also be forced to run at a sustainable, aerobic pace, which you’ll see is far more comfortable and fun! Remember, you don’t need to run fast or far to be a runner. Slow down, ignore others around you, make the most of nature, and you’ll find yourself buzzing to get out on your next run.